Project 2 is finished. I really enjoyed the simplicity and ease of doing this one. 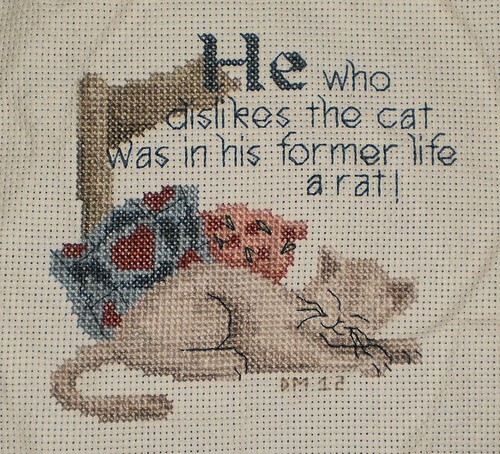 It was mostly full cross-stitches. I don't mind quarter, half and three-quarter stitches but sometimes I just want to put the needle in and pull the needle out and not have to worry if this is to be at an angle. Once the swans comes back from framing, this will go out and I can cross someone else off my Christmas list. I'm liking, even more, the peace I'm feeling as I'm working through these projects. Now that this is done, the weekend's task is to either finish or make major progress on, the green "Merry Christmas" banner. I've decided I'm not looking ahead to the next cross-stitch project until that banner is done.